I love the term ‘drinking my carbohydrates’. It is what we say when we know it is going to be a heavy weekend. Some men refer to beer drinking as “lunch in a bottle”. Which ever way you look at it, drinking beer is a high calorific endevour. I love artisan beers and in summer a really cold one is just what I need when the day is done. However, in my attempt to lose weight I have sworn off all beer! I have not yet sworn off bread however, and when I saw this recipe in my new recipe book I just had to give it a go. I mean, who can resist beer bread? And especially if you top it with some aged cheese. A grand beer bread recipe! easy to make too! I think I may have to invest in a bread maker! Beer bread is a winner isn’t it, and totally agree with a rockin’ cheese on top, well you can’t go wrong. I bet the cloves add a bit of unique aroma to the bread. Oh my the gluten in this loaf might make me feel miserable for weeks but it might be worth it. One has to be careful with cloves, but they do add amazing flavour. I wonder if I could make a gluten free beer bread? Its worth making more than once! Beer bread?! Heck yes, count me in. Sounds delicious! I don’t eat enough bread to make this worthwhile unless I have people coming to help eat it. 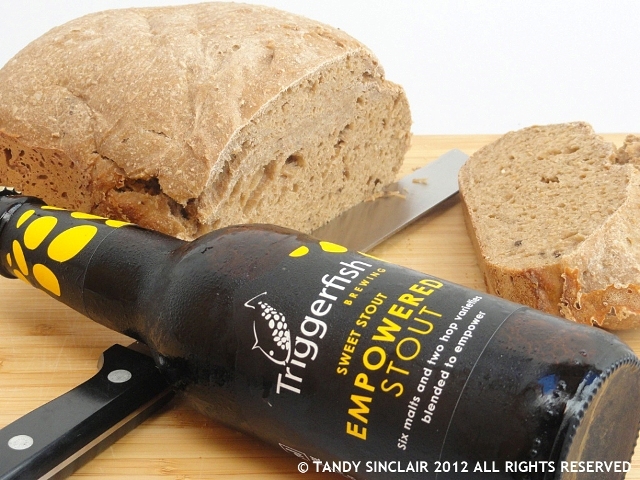 Beer and bread — they just sound good together, don’t they? Good thing you haven’t sworn off bread, or we wouldn’t have learned about this great recipe! Aged cheddar sounds like the perfect pairing. the bottle is from a local brewery which we love going to! Lovely beer bread recipe Tandy. Sounds fabulous! I am definitely bookmarking this recipe. I must try a sourdough version! I don’t like drinking beer but I love to eat it in bread form! This looks great! This is a much nicer way to enjoy a cold one! You know you inspired me to buy a bread maker some time ago, it is still waiting for its premiere and I might try your beer bread recipe. Thanks! Now, you only have to tell me where to store it! I have started to use a spare room for all the machinery. If I had one wish it would be an XXXXXXL kitchen! I should make it again Marta!